*The 6th camp is found in the Challenge Tomb, the 7th and 8th appear later after you finish the level so you can revisit certain areas. These are not counted in the total on the in-game map. 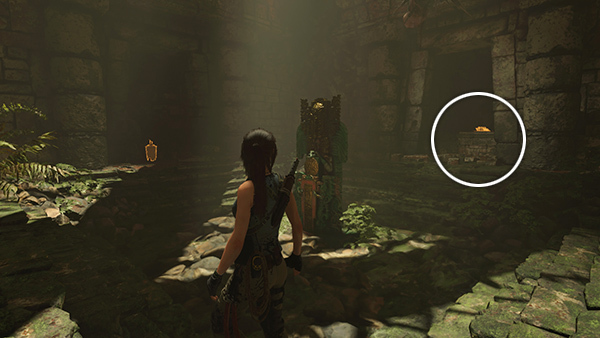 NOTE: The totals above do not include the items found in the ECHOES OF THE PAST SIDE MISSION and FORGE OF DESTINY CHALLENGE TOMB, which are part of the first DLC pack, THE FORGE, covered in a separate section. 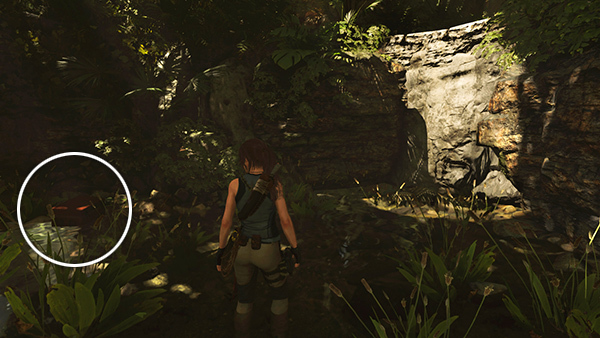 VILLAGE OUTSKIRTS: Lara and Jonah enter this area through a tunnel from the eastern end of the PERUVIAN JUNGLE level. Follow the path down to the village. 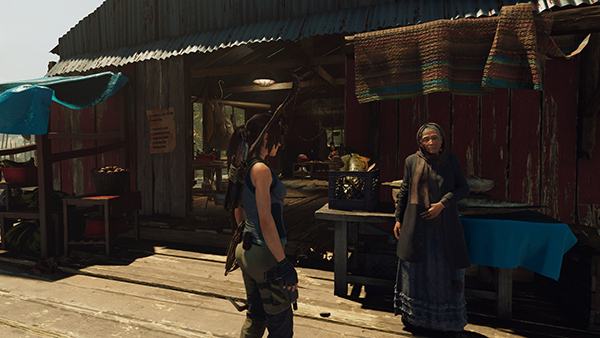 Lara and Jonah meet Abby, a local business owner who is friendly but clearly wary of outsiders. Once Jonah assures her they're not with Trinity, Abby opens up a bit. 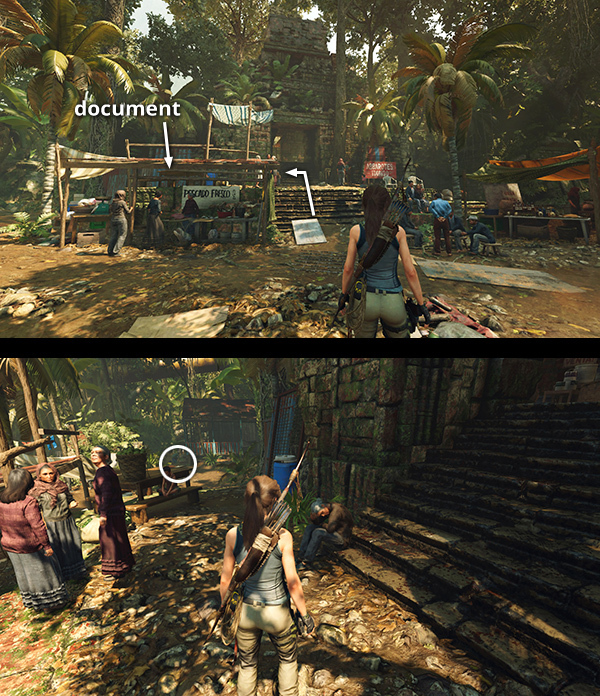 She sees Lara's photo from Cozumel and says she's seen a similar inscription in the nearby ruins. 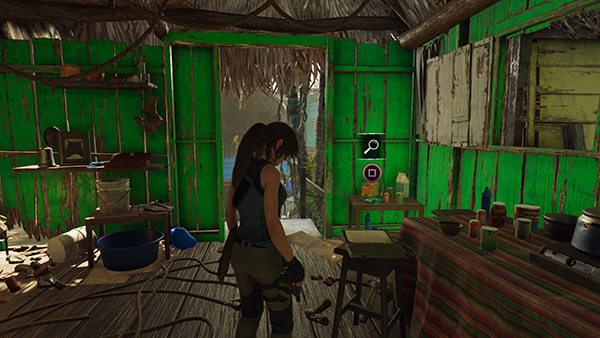 Lara goes off alone to investigate. You can eavesdrop on Abby and Jonah for a bit if you like and crack open a salvage crate in the corner nearby. Then move through the cantina toward the village. There are a few NPCs you can speak to, and when you pass the waitress, she tells you there's a market in the middle of town, and it is indicated on your map. 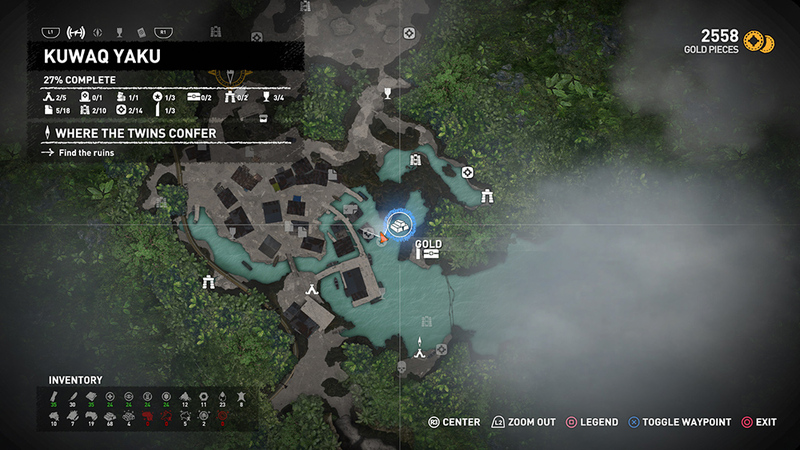 If you like, you can go there now, or follow the Objective Beacon to continue with the main story (screenshot), but there are also a number of collectibles in and around the village. 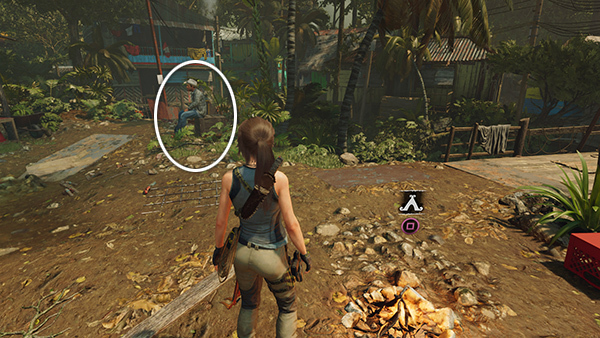 SIDE MISSION – INVASIVE SPECIES: If you talk to the man sitting on the box just west of the campsite (screenshot), he'll tell you about a shady character named Omar, and the Mission Giver for this level's Side Mission will be revealed on your map. Since Missions are optional, and this one is fairly extensive, it's covered on a separate page. 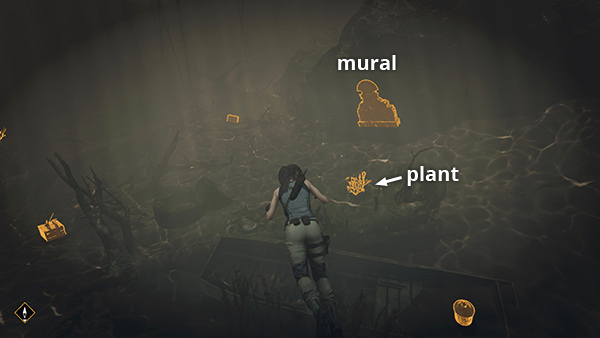 Follow this link for the SIDE MISSION: INVASIVE SPECIES WALKTHROUGH, which includes a mural (1/1), a relic (1/4), the river HAWK PISTOL, 250 gold pieces, and the Unwelcome Guests Achievement/Trophy. NOTE: You don't have to do the mission first thing. I just list it here since you learn about it early on. 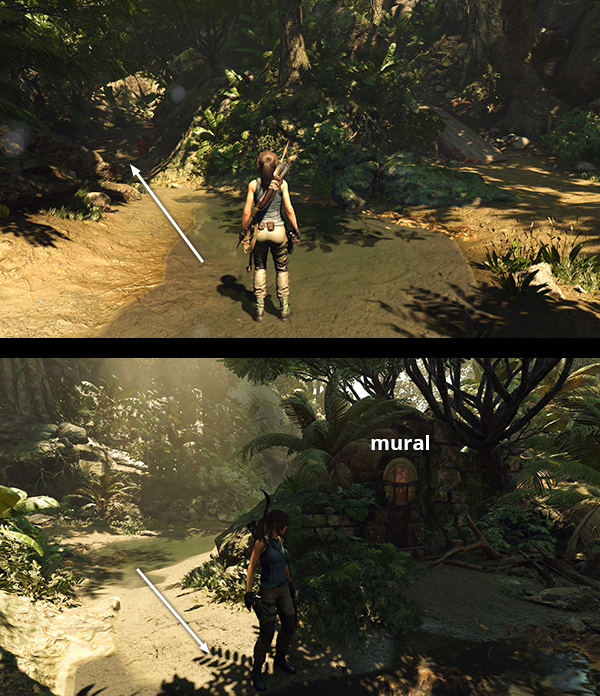 Also, you can read the mural without doing the mission, but you won't be able to get the relic, since the tunnel into the side area is blocked off until you've talked to the various characters involved. There's a document (2/18) Fuel for the Future (A Community in Need Story), sitting on a box near the fluorescent green house, second on the right as you enter the village via the rusty foot bridge. 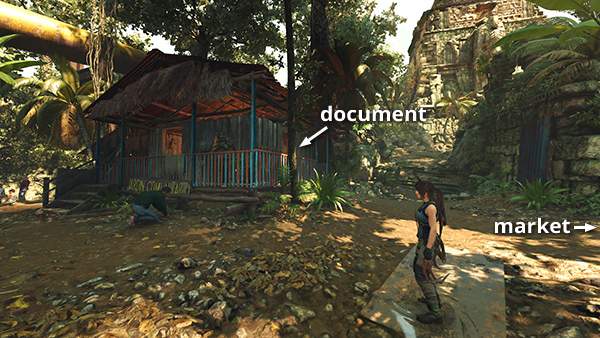 (screenshot) Another document (3/18) Family Tree (A Community in Need Story) can be found inside that same green house. 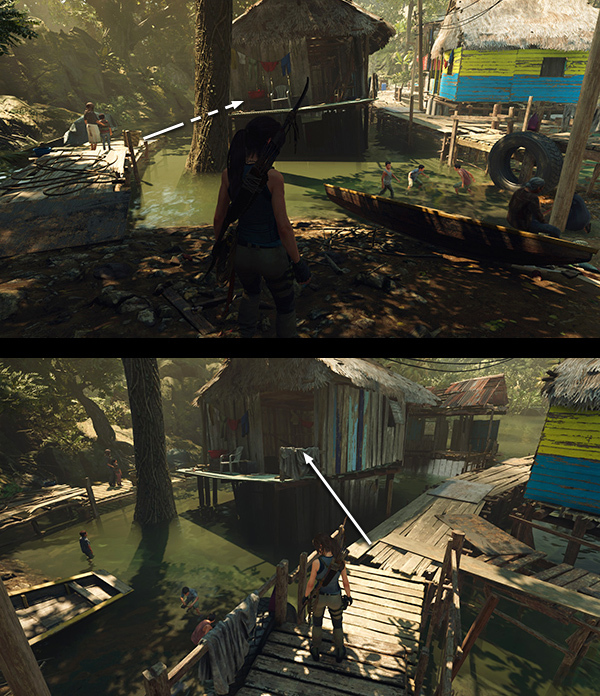 (screenshot) If you exit through the back door, you'll see several shacks connected by walkways above the river. Follow the shore around to the northeast and jump from the dock onto the small balcony attached to the northernmost house. 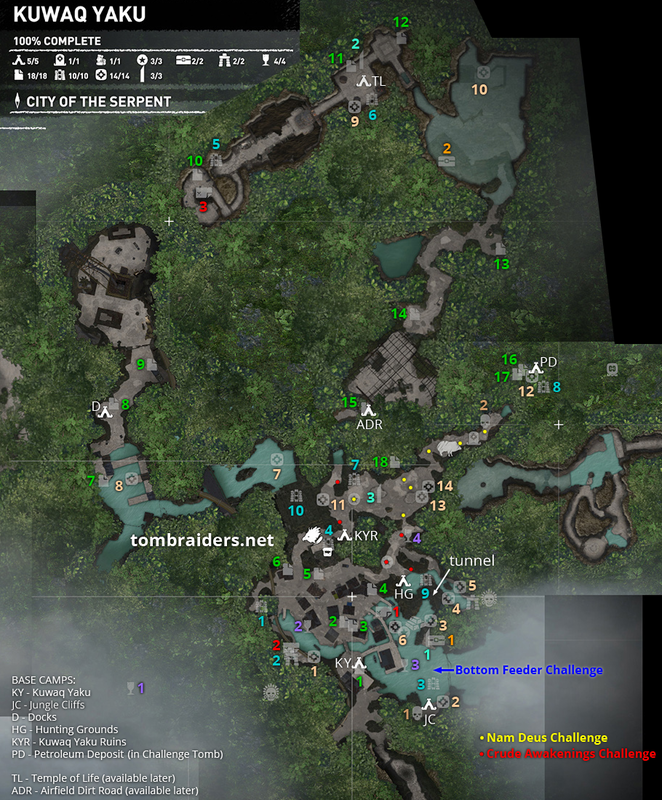 (screenshot) Inside is an archivist map (1/3). 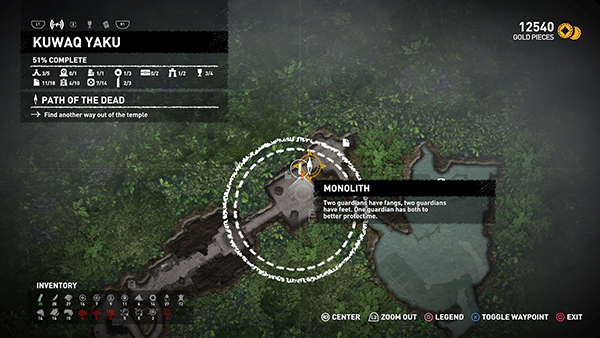 (screenshot) Examine it to reveal several documents, murals, and relics, as well as a nearby monolith, on your map. FIRST CRYPT ENTRANCE – WAYTA, THE TYRANT: Just south of the dock and the kids playing is the entrance to one of the level's crypts. 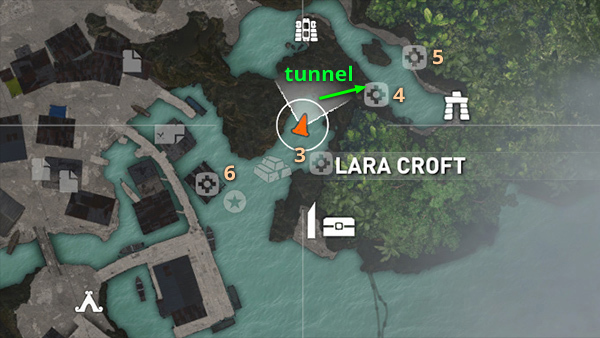 (screenshot) You can also reach it by following the stream that runs under the rusted footbridge near Abby's place. 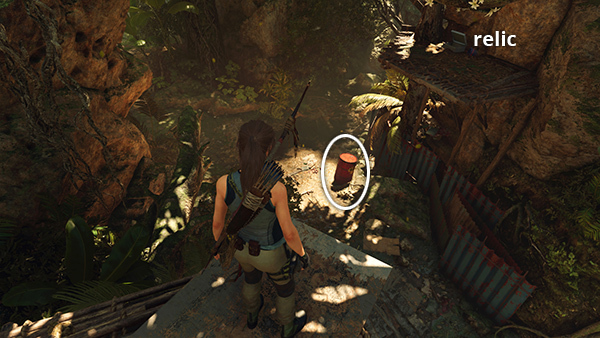 (screenshot) Look for several blue plastic barrels and you'll find the cave opening nearby. Before entering the crypt, dig up a survival cache (1/14) on the riverbank just south of the cave opening. (screenshot) The crypt itself is covered on a separate page. Follow this link for the FIRST CRYPT WALKTHROUGH, which includes an archivist map (2/3), mural (2/10), and a sarcophagus containing an outfit component, Vestige: Nine Strides' Boots, and 750 gold pieces. IN AND AROUND THE RIVER: In addition to the market in the village, there's a smaller FISH MARKET on the dock just east of Abby's place and the Kuwaq Yaku Base Camp. If you speak to the old woman standing outside, she'll reveal the location of some gold on your map. (screenshot) We'll retrieve it shortly. Dive off the dock behind the FISH MARKET. Turn around and swim down to find a relic (3/4), a Cone Mold from the Fortune and Glory Story, on the bottom near the corner of the pier. 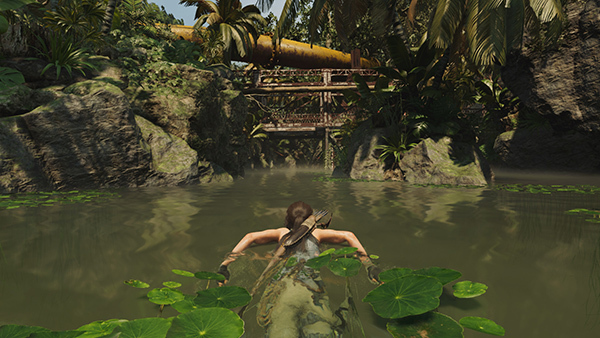 (screenshot) Swim to the southeastern shore of the river to find the Jungle Ruins Base Camp and an explorer backpack (1/2). 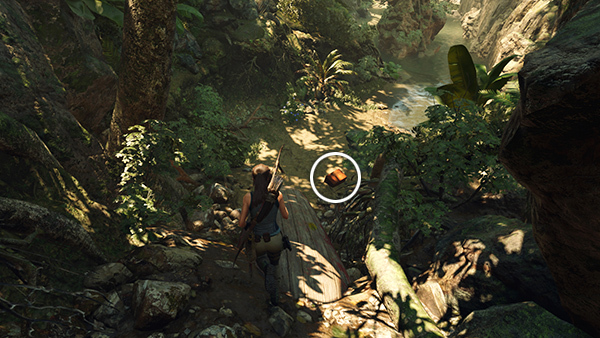 (screenshot) Examining the pack reveals the location of a nearby survival cache (2/14) (screenshot), as well as a number of others. It also marks the second crypt entrance and a treasure chest on your map. When you pick any of the plants growing on the bottom, you'll initiate a Challenge: Bottom Feeder. The goal is to harvest 5 aquatic plants. This on is not tricky, since all of the plants can be found here in the river. I haven't marked them on the map since there are more plants than you need for the challenge. 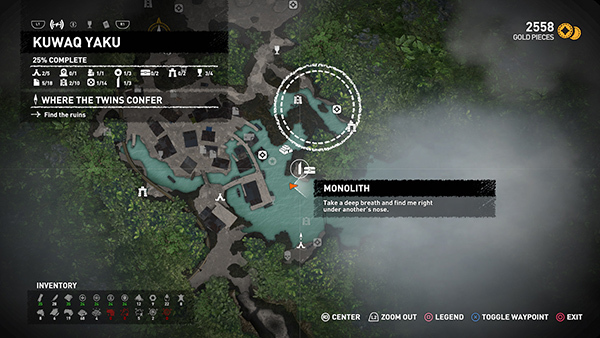 BUG NOTE: A number of players have reported a bug in which the survival caches connected to the monoliths don't appear where they're supposed to be. This has apparently been fixed in a recent patch. If you can't update your game for some reason, I recommend going after the treasure as soon as you receive the clue. 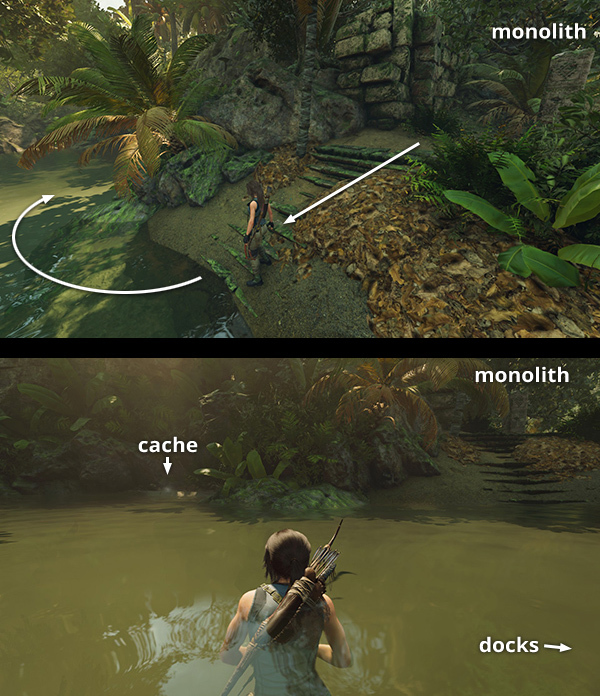 Head down the steps to the left of the monolith and swim into the inlet to the northeast as far as you can (screenshot/map) Dive below the surface and swim forward through a narrow gap in the rocks. (screenshot) Continue forward and swim to the surface for air if necessary. The dive down again to find the monolith riches, a survival cache (3/14) buried right "under the nose" of a submerged statue. (screenshot) Gather some salvage and other resources on the bottom and return to the surface. If you like, you can explore further in this area, but it is covered later on. Return through the underwater passageway to the river near the village. 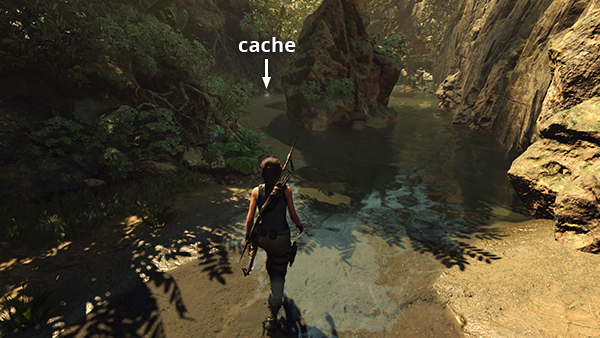 There's a survival cache (4/14) buried on a ledge at water level on the left. 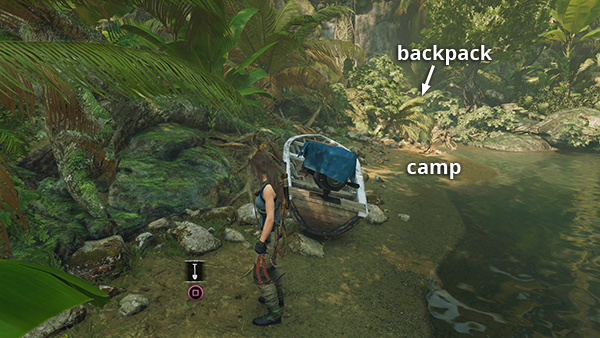 (screenshot) It's not one of the ones revealed by the backpack, but you can still dig it up. 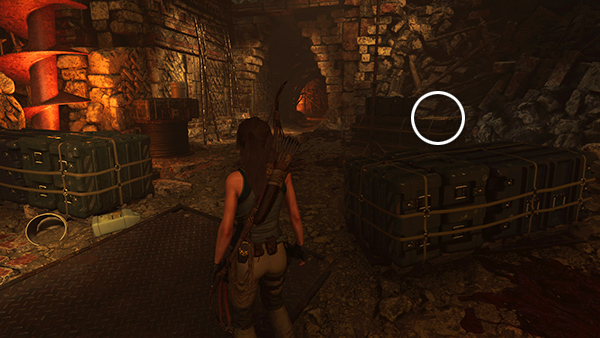 The treasure chest indicated on your map when you examined the explorer backpack is in an underwater tunnel beneath the monolith, but you can't open the chest until you get the LOCK PICK. It is covered below under REVISITING THIS LEVEL. AMMUNITION/RESOURCES: Arrows, Handgun Bullets, Machinegun (Rifle) Rounds, Medicine, Perception Plants, Focus Plants, Salvage, Black Powder. 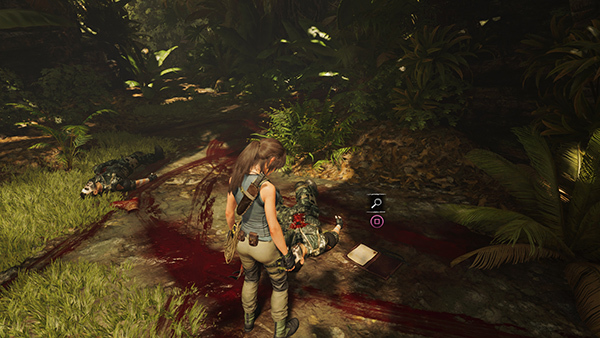 NOTES: Of course you should buy items that suit your play style, but In general, you won't need to buy ammo or crafting resources since there is plenty to find, especially if you explore everywhere and take care to search enemy corpses after every fight. My preference is to buy pouches and containers first, then weapons and other special items. The only time I would buy salvage or rare resources is if I only needed a little more for a particular upgrade. You will be able to return to Kuwaq Yaku later in the game, so you don't need to buy everything now. In fact, I recommend trying to save some gold for the merchants in the Hidden City. There is one traveling merchant who sells the LOCK PICK (2800 gp) and ROPE ASCENDER (3300 gp). If you save enough by the time you reach the Hidden City, you can buy them the first time you meet her, and not have to worry about finding her again. You will be able to buy things more cheaply once you unlock the Seeker Skill Crow's Charm. You can get by just fine with the weapons you find in the game, and buying weapons is not required for 100% completion. But if you want to experiment, you can save the game, buy a gun or accessory from the merchant based on its basic description, return to a base camp to examine them, then reload if you don't like what you bought. If you don't have many gold pieces at this point, you can sell just about any resource. Naturally you'll want to hang onto crucial items like healing herbs and anything you're saving for weapon upgrades and outfit repairs. 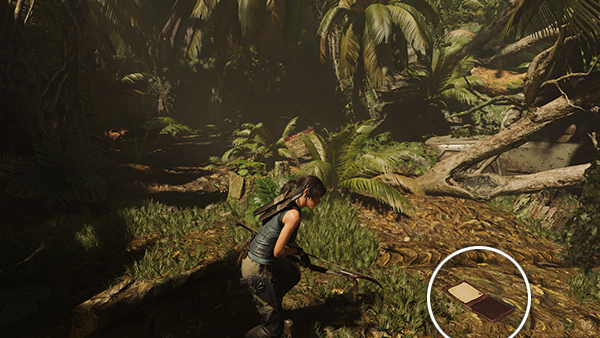 But once Lara's inventory is full, you might as well sell off a few items you don't use very often. You'll be able to replenish your stocks as you explore. Gold and Jade are not needed for crafting, so there's no need to hold onto them. BUG NOTE: Some Xbox One players have had issues with 100% completion due to a bug. 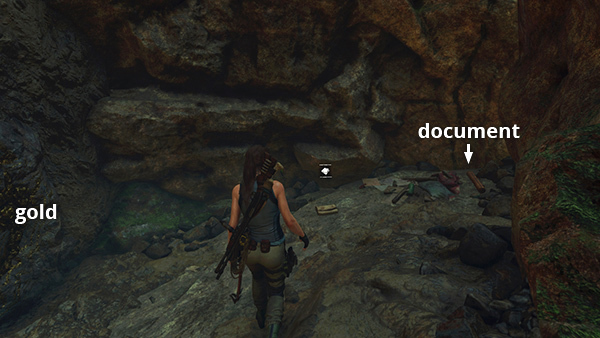 Until a cause is determined and a patch released, you may want to avoid buying all but essential equipment (e.g., satchels and pouches, and later the rope ascender, lock pick, knife upgrade). See this thread on the LCO Forum for details. UPDATE: This bug appears to have been fixed with patch #3. EAGLE HUNTING: If you like, you can also hunt the eagle that lives in this area. 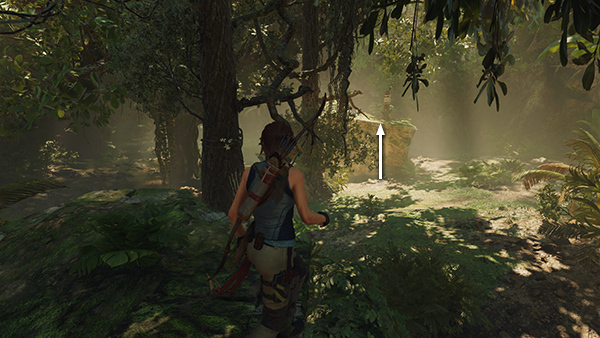 (screenshot) It is marked on your map and you'll probably notice its shadow on the ground as it circles above. Shoot it down for a nice XP award then collect eagle feathers to sell or use in crafting outfits. 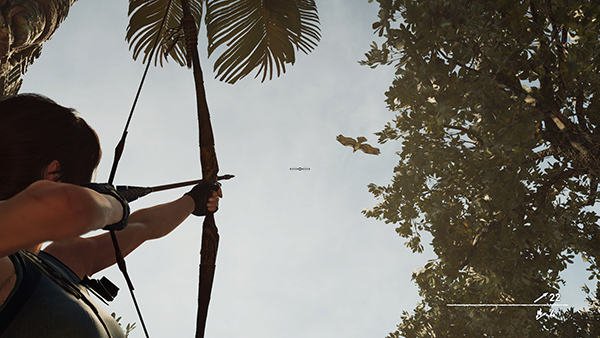 Like the condor near the Plane Fuselage Base Camp in the PERUVIAN JUNGLE level, this eagle respawns, so you can fast travel back here later and hunt it again. 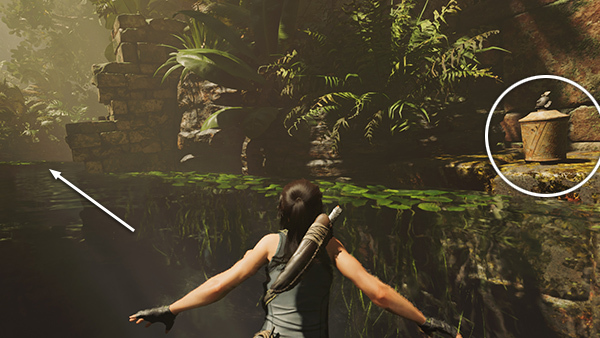 When you enter the ruins, a cutscene begins: Lara begins to look around and soon Jonah arrives. She notices an interesting inscription where the painted wall has crumbled away: "Ix Chel and Chak Chel. The twins come together...." Being the respectful and well-trained archaeologist she is, Lara immediately starts whacking away with her axe to reveal the rest of the inscription, "...before following the path of the living." Jonah points out that the carving has been defaced, like the one they found in Mexico. 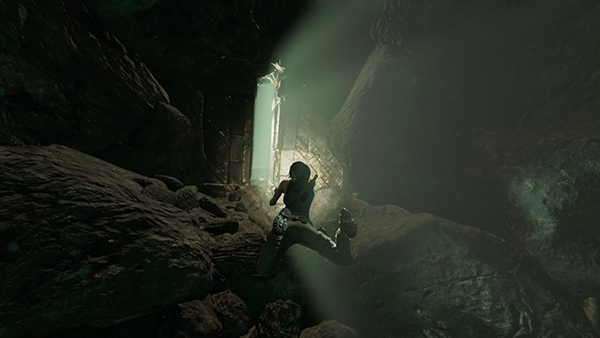 Lara breaks through the wall and pushes on, while Jonah remains behind to hunt for further clues. She continues up a flight of stairs and through two ancient but still functional doors to emerge outside. In the distance she spots the temple they've been searching for, but Trinity is already on the scene, trying to blast their way in with explosives. 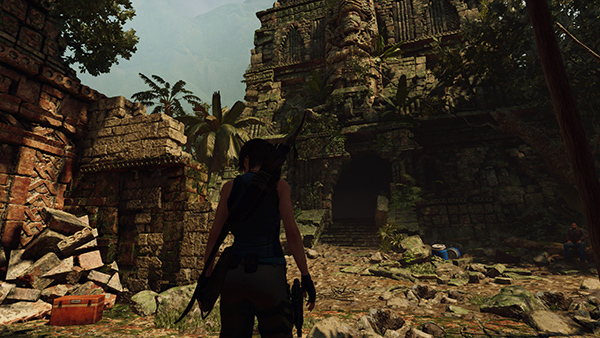 As Lara approaches the bridge, a group of Trinity soldiers drives across and she overhears them saying that Dr. Dominguez has come to Peru. 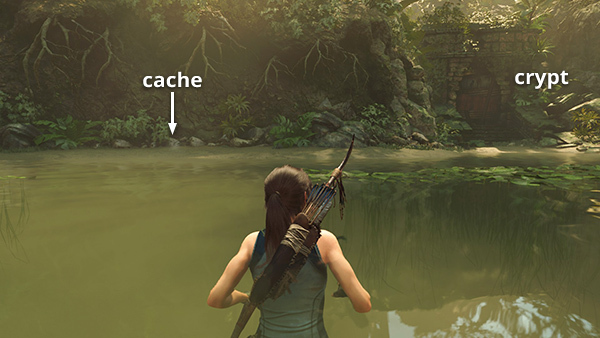 Loot a resource canister below the surface on this side of the bridge, then swim under the bridge and onward, picking a few aquatic plants on the way. 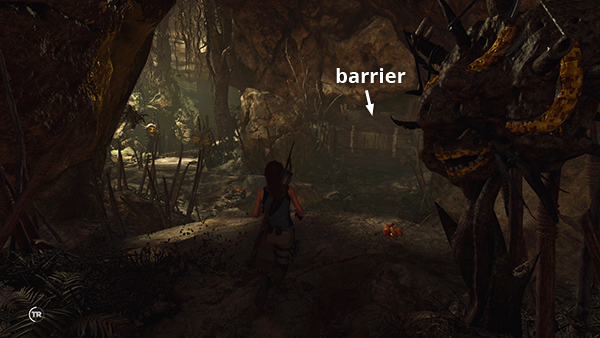 When you come to the wooden barrier, swim through the opening below the surface (screenshot) to trigger a cutscene. 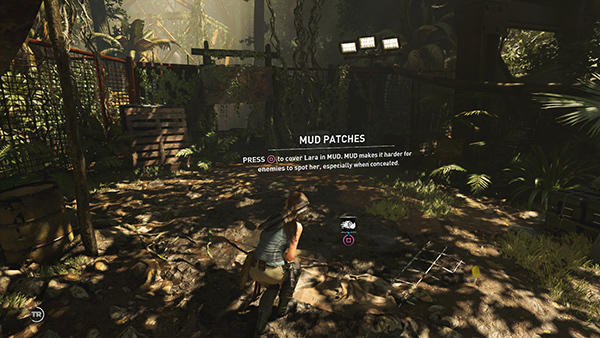 Lara surfaces quietly near a boat dock where two men are complaining about the state of their state-of-the-art equipment. 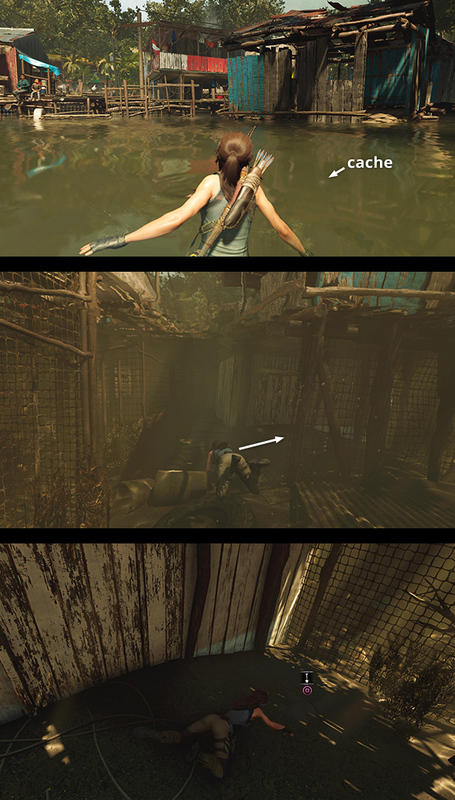 Lara stays quiet and waits for one of them to move off. Before moving on, make sure you loot all the bodies, dig up the survival cache (7/14) buried beneath the middle dock (screenshot), and read the document (7/18), End Times, from the Trinity Story on the platform at the top of the stairs. (screenshot) Then continue along the upper walkway to the north. 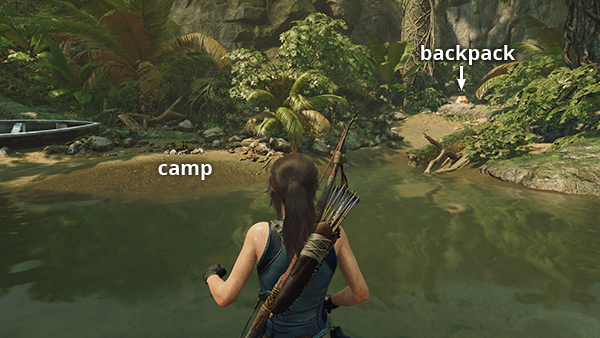 Lara remains on alert until you approach the Docks Base Camp, just ahead on the left. After a quick check-in with Jonah and Abby by radio, rest at the camp if you like, then examine another document (8/18), Croft Report, from the Trinity Story, sitting on a storage box near the camp. 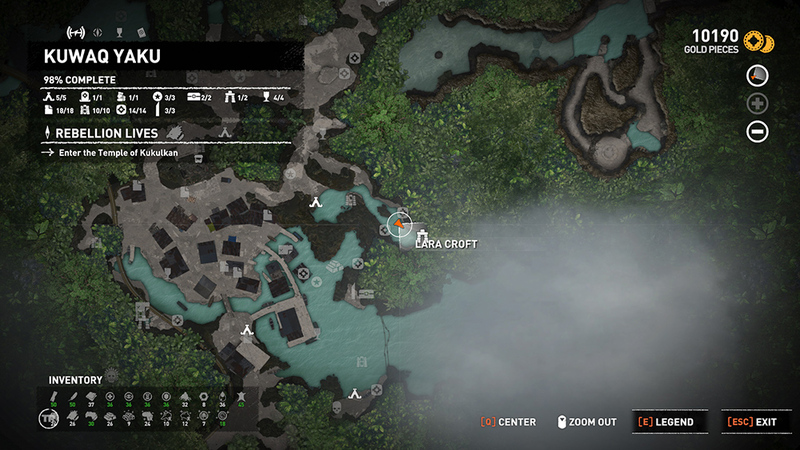 (screenshot) Then continue north toward the objective. You'll come up against 8 mercenaries in all, two or three just beyond the barrier, one or two more just ahead, and a group of 4 guarding the area you're trying to reach. Again, if you want to bring out the big guns and dive right in, by all means, go ahead. If you want a stealthier approach, there are some ideas on this page with screenshots, including info on using the Serpent's Fury skill, which you'll need for the Chain Gang achievement/trophy. When you've defeated all the enemies, make sure to loot the corpses and collect various resources lying around. 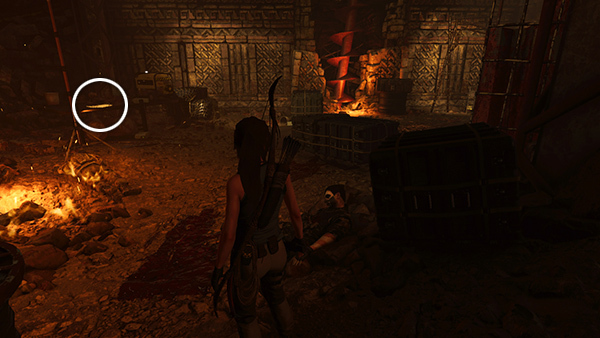 After the fight, Lara contacts Jonah with an update. Commander Rourke, Dominguez's right-hand man, is now here in Peru. He has secured a dig site somewhere down below, and she wants to check it out. CAVERNS BENEATH THE OIL RIG: Follow the path down into the cave, picking up various resources along the way. There's also a document (10/18) Temple Survey (Trinity Story) on the left side of the room at the bottom of the path (screenshot) and an archivist map (3/3) sitting on one of the storage boxes on the right. (screenshot) Continue along the passageway as it narrows and hooks around to the north. 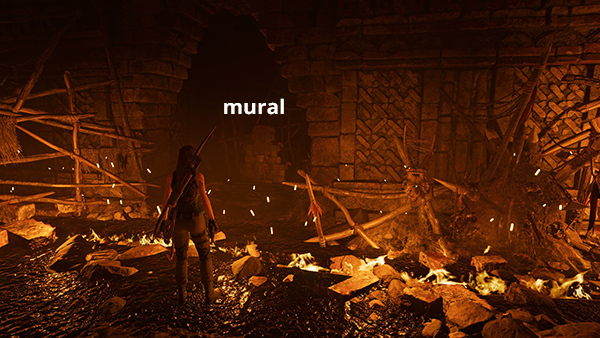 When you emerge from the low tunnel into the room on fire, look for a mural (5/10), Temple of Life (Mam Dialect/Exodus Story), in an alcove on the left. Jump over the flames to reach it. 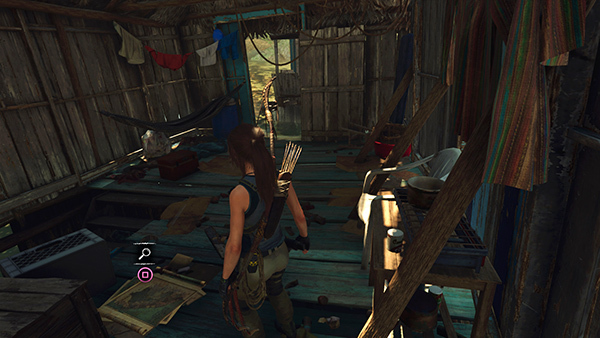 (screenshot) Continue through the doorway to the northeast and down the stairs into the temple. 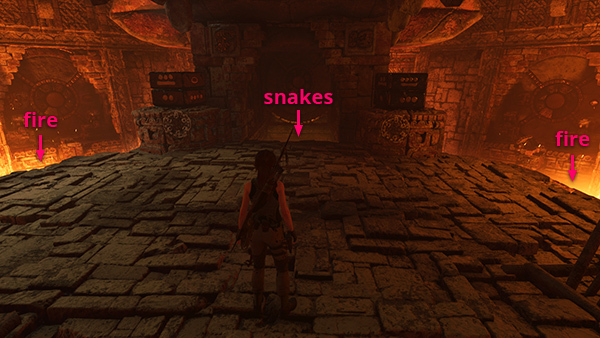 TEMPLE OF LIFE GATE PUZZLE: It's probably obvious, but you should avoid the flaming pools on either side of the platform and the pit full of coral snakes ahead. 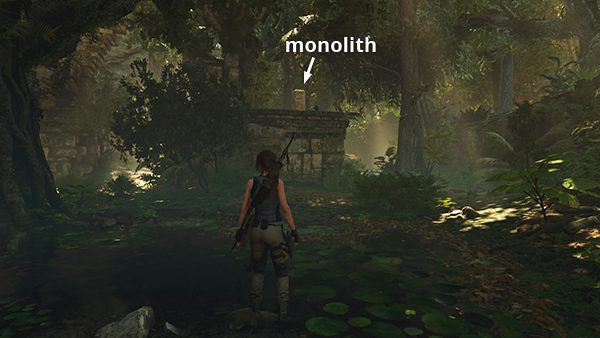 (screenshot) The puzzle itself consists of 2 pillars made of polished stones, stacked one on top of the other. Each stone in the pillar is inscribed with five Maya numbers. The wheels below each pillar allow you to rotate the column to the left or right. In the alcoves near each pillar is a circular panel with various inscriptions. 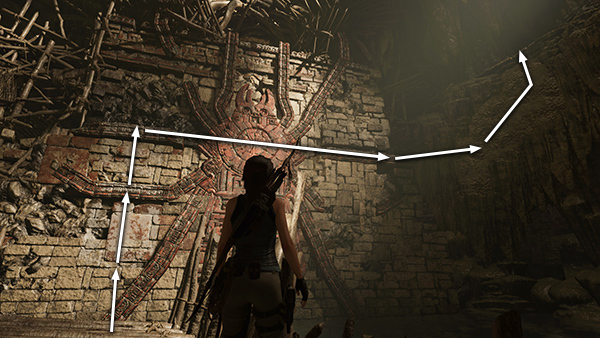 Lara says, "The numbers on the pillars look like the first half of dates, Ix Chel on the left, Chak Chel on the right." 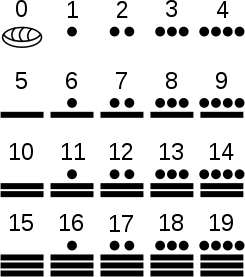 Maya numerals key courtesy of Wikipedia. You don't have to know the Maya numeral system to solve the puzzle, but it helps to have some idea of what you're trying to achieve. This diagram shows the basic conventions, dots fro numbers 1-4, one horizontal line for each 5, etc. DAIS WITH MURAL: As you climb the steps, a cutscene ensues. Lara tries to contact Jonah but gets Abby instead. Lara describes the mural she's seeing: "A journey...entering through a jaguar mouth...follows a serpent toward a silver eye. On the way there's a spider and an eagle that rises toward a temple." Abby says she knows where to find the "jaguar mouth." Jonah gets back on the radio and tells Lara he's found something she's going to like. 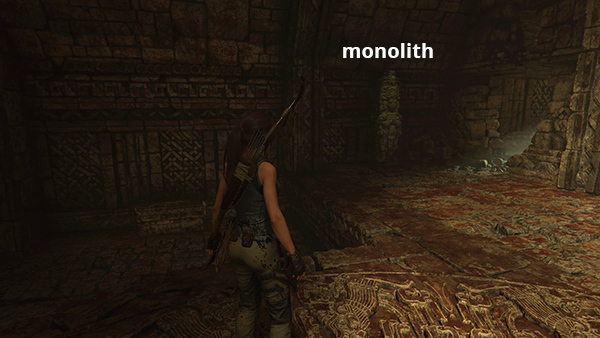 NOTE: If you can't read the monolith at this time, keep collecting documents and relics to improve your Ancient Dialects until you reach the Proficient level. There is no base camp here now, but once you reach the Hidden City, the Temple of Life Base Camp will appear on your map, and you will be able to return here using Fast Travel. Exit through the hole in the wall near the monolith. 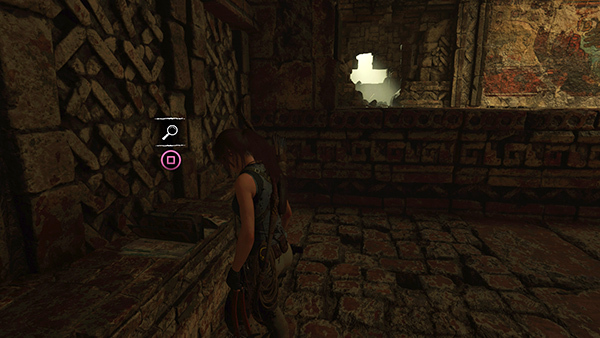 Examine the tomb stele in the courtyard (screenshot) to unlock the Seeker Skill, Eagle's Talon, which allows Lara to string up enemies using rope arrows. Search the alcoves surrounding the stele to for some supplies and another document (12/18), Birthing the Serpent (Mam/Metamorphosis). 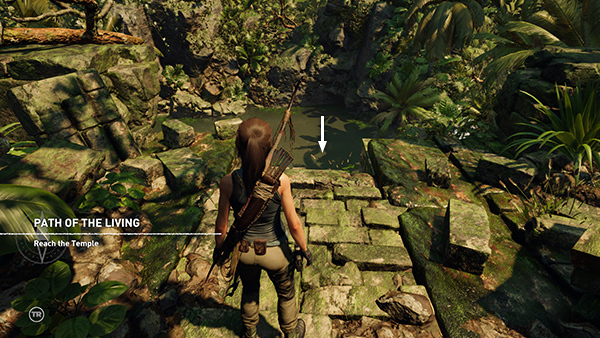 (screenshot) Then exit to the southeast and dive into the pool. 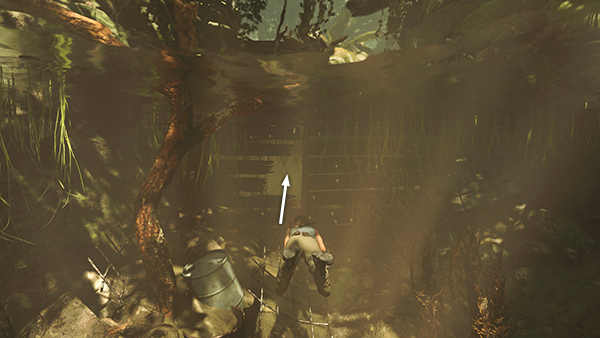 FLOODED AREA WITH PIRANHAS: As you enter the water, an on-screen tutorial introduces underwater predators like piranhas. 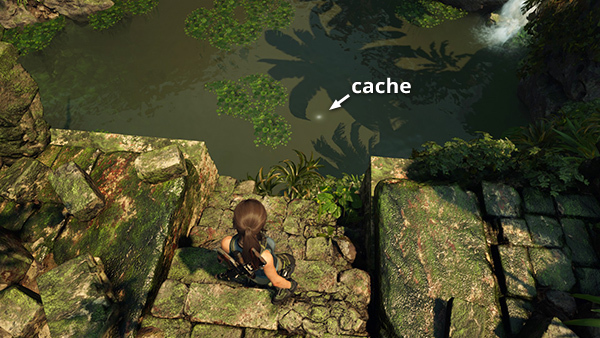 If you've been with us since Tomb Raider III, this will bring up fond memories. Or not. In this walkthrough, piranhas are marked as hazards rather than enemies, since there's no way to kill them. You can only avoid them. 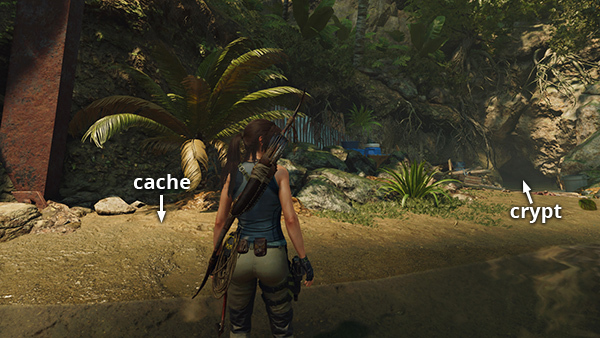 The tutorial text explains that you can hide in patches of sea grass to avoid being detected. 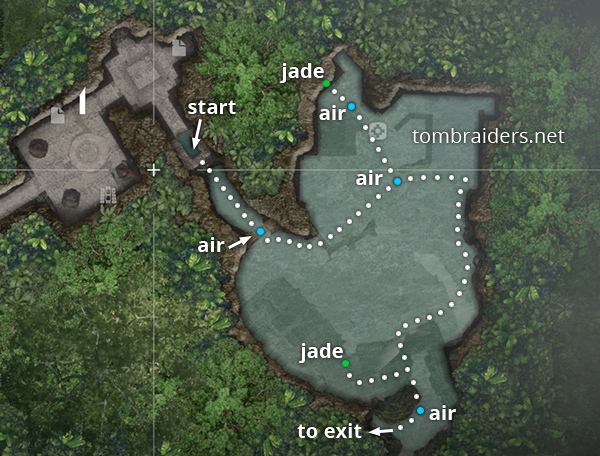 This FLOODED RUINS AREA MAP shows the path outlined below. It may be enough to get you through, but if you need more, there are screenshots linked below. 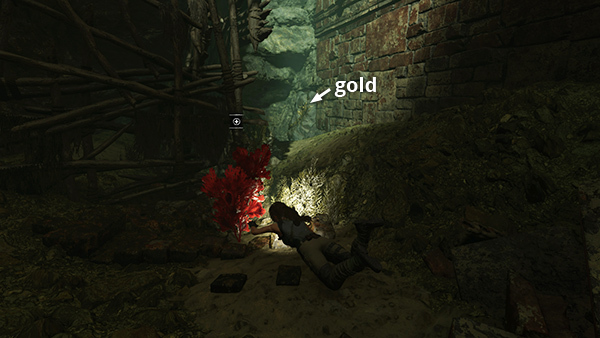 NOTE: If you've checked the annotated level map, you'll notice there's also a treasure chest in this area. 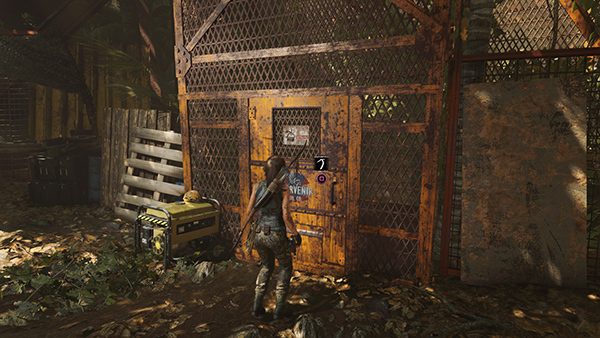 You can't open it until you get the LOCK PICK, so it's covered at the end of the below under REVISITING THIS AREA. The path curves along the cliff edge. Then you must climb up onto a low rock ledge to continue. 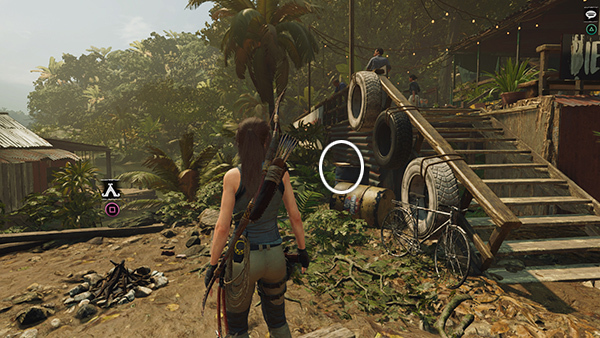 A little farther along the path, Lara comes upon a truck that's been run into a tree. Move toward it to trigger a cutscene. A soldier wearing a helmet with camouflage netting is clearly bugging out. 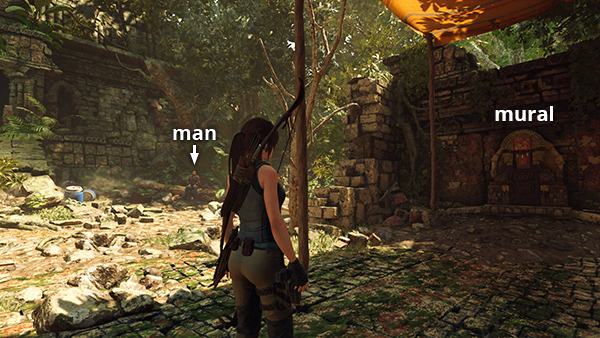 As Lara watches from hiding, a grayish, humanoid creature leaps out of the bushes and attacks the man, then flees before Lara can get a good look at it. Advance to the area where the man went down, and you'll find a document (14/18), Operation Update (Trinity) sitting on the grass near a fallen tree and "Danger" sign. 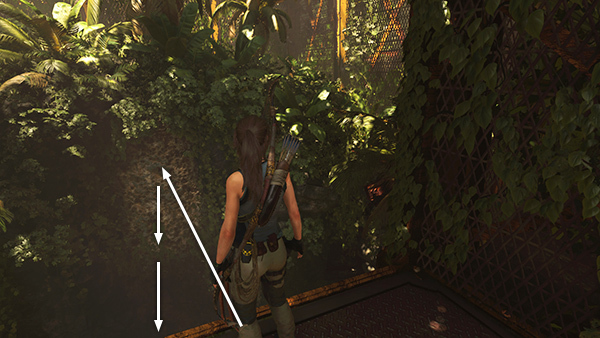 (screenshot) Continue southward and squeeze through the narrow opening into the next area. 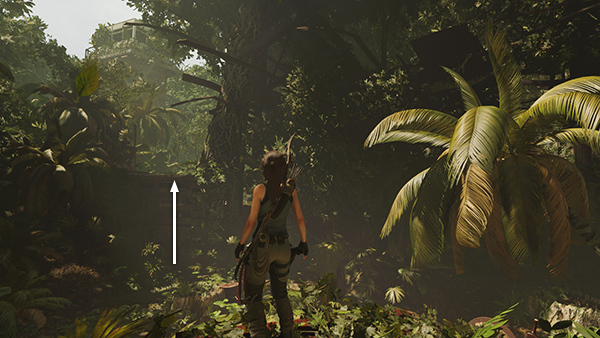 There are quite a few bushes where you can hide; some climbable trees where you may be able to use that Eagle's Talon maneuver; a few rickety buildings, some with roofs to climb on; a patch of mud in the southwest corner, where you can apply camouflage; and a vine-covered wall inside the wooden building directly ahead as you enter the clearing. There are also various bottles and red jerrycans here and there. You can toss them as-is for distraction, or combine them with cloth to make Molotovs. 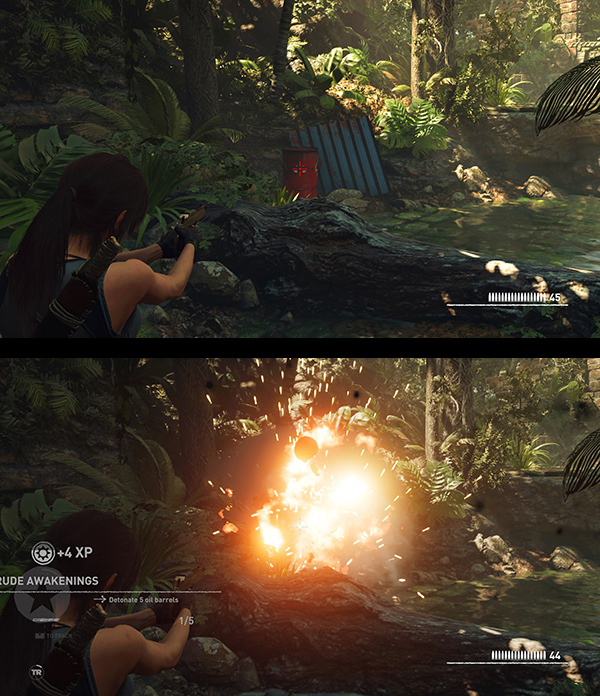 The red cans also explode when you shoot them, but enemies need to be fairly close by to take damage. 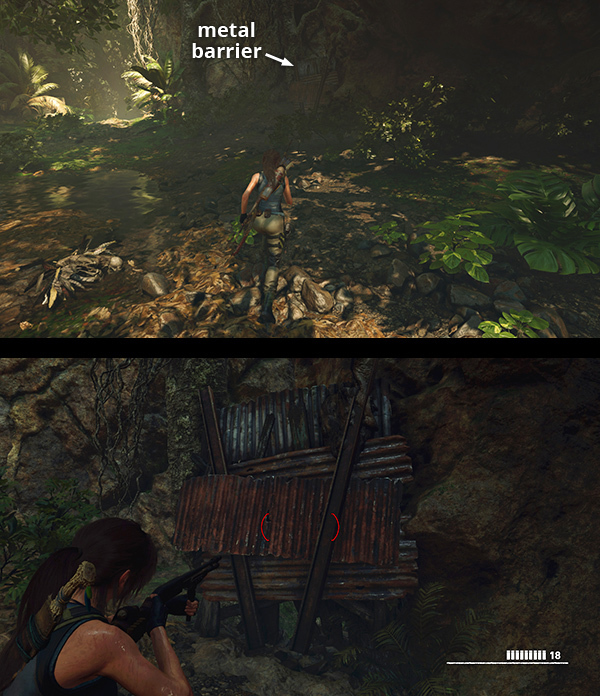 It's possible to stealth through this whole section, but it takes a lot of patience. You may want to even the odds by killing off a few of the unarmored guys with stealth attacks. Then switch to heavier weapons to finish off the rest. I've included one possible strategy on this page with screenshots. Note that you can't kill the men wearing helmets with a single headshot, and it will take more than one arrow to penetrate their body armor, so you'll need to use different tactics for them. 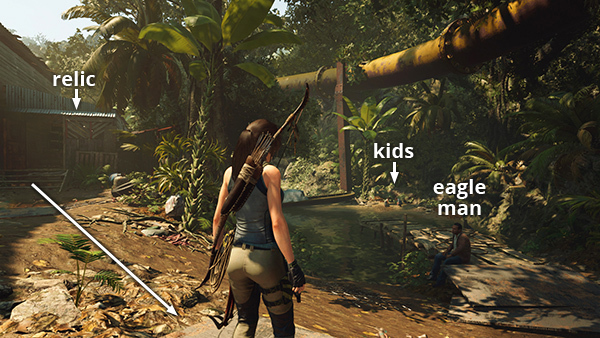 Obviously guns will work, but they're also vulnerable to Eagle's Talon and other stealth attacks. When the last man falls, a voice over the radio says, "We're here. Give us 60 seconds and we're in." 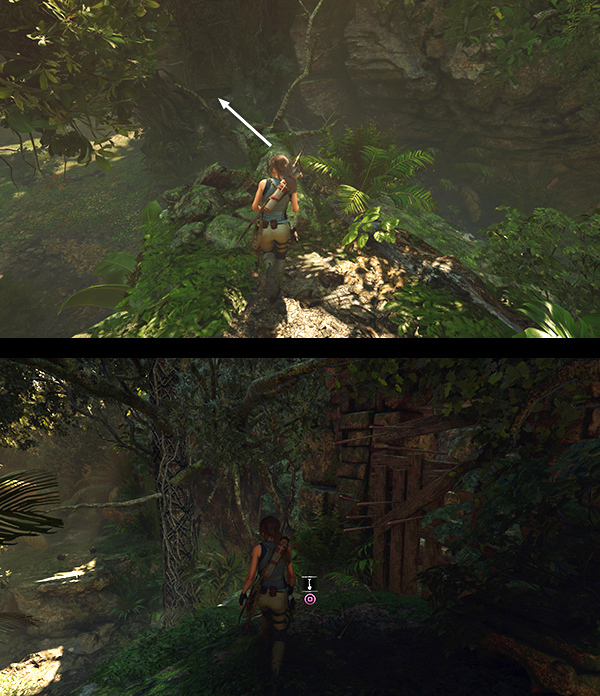 Lara remains in defensive posture, but you're in the clear for now. Search any bodies that you may have missed and pick up a few supplies scattered around (cloth, fat, healing herbs, etc.). Then make your way to the southeast corner of the area. There's a wooden wall there that you can climb to get out of this enclosure. (screenshot) As you leave the area, you receive an XP award and a new goal. 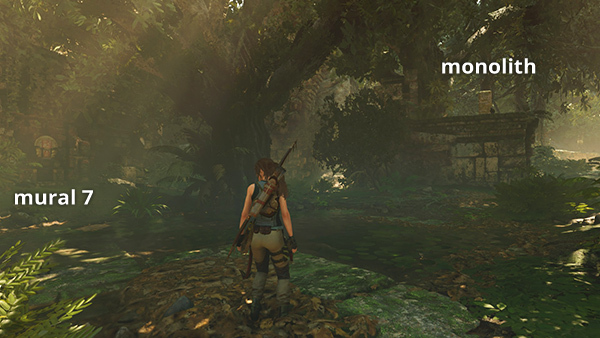 CORPSE-STREWN PATH THROUGH THE JUNGLE: As you follow the path to the northwest, Lara comes across a group of Trinity soldiers who've met a violent end. 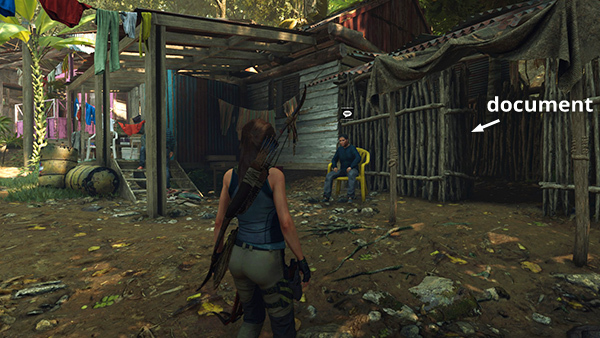 Lara contacts Jonah and Abby on the walkie and describes the creature she saw earlier. Abby says it sounds like the legend of the Pishtaco and asks if Lara is kidding. Loot the dead soldiers and examine the document (15/18), Scouring the Globe (Trinity) lying on the ground nearby. 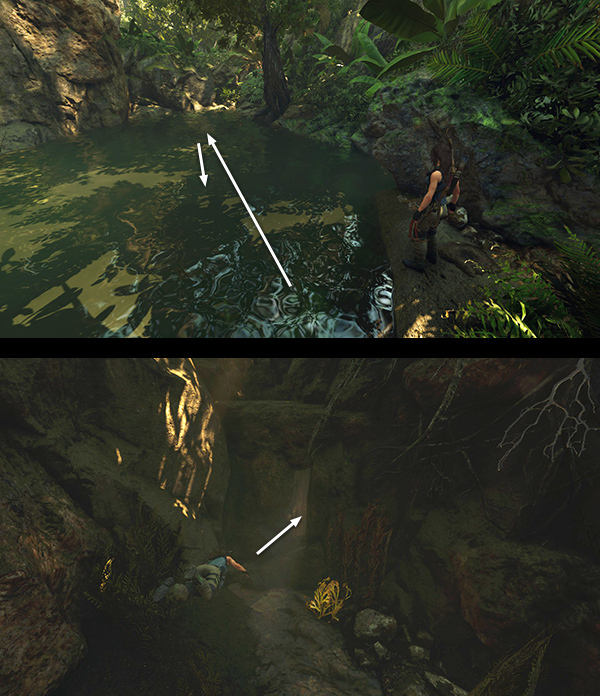 (screenshot) Then continue along the path, which ends abruptly above a pool. Dive in and swim across the pool. 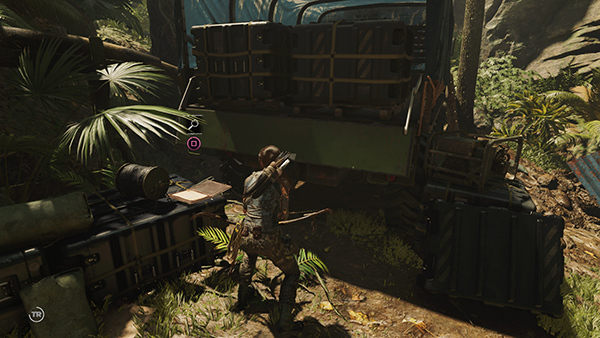 NOTE: There is no base camp in this area, but later, when you reach the Hidden City, the Airfield Dirt Road Base Camp will be marked on your map, near document #15, and be accessible via Fast Travel. 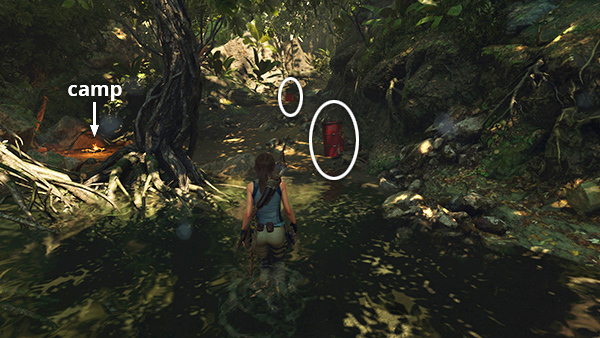 NOTE: The location all of the challenge barrels are marked with red dots on the annotated level map. Climb up out of this little depression and dig up a survival cache (10/14) buried just ahead on the right. (screenshot) Go up the steps to the left. Off to the left (east) is the HUNTING GROUNDS. We'll explore there soon. For now, continue up the steps to the right (south). Just ahead is a resource cylinder and another oil barrel (2/5) shoot it for the Challenge. 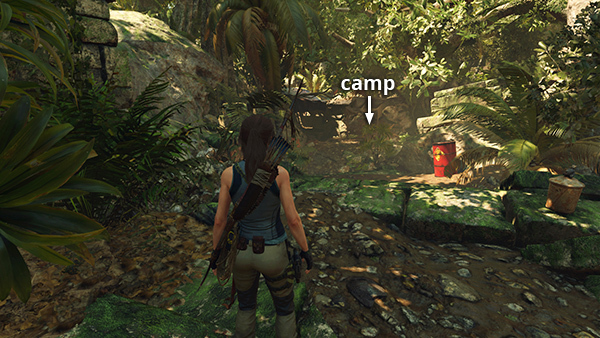 (screenshot) Then continue to the Kuwak Yaku Ruins Base Camp, under the little shelter just ahead. You'll probably have some Skill Points to spend and a few upgrades to make by now. If you don't already have the Warrior skill Puma's Feint, I recommend taking it now, since it will come in handy soon. There's also a salvage crate under the shelter, and health herbs and hardwood nearby. 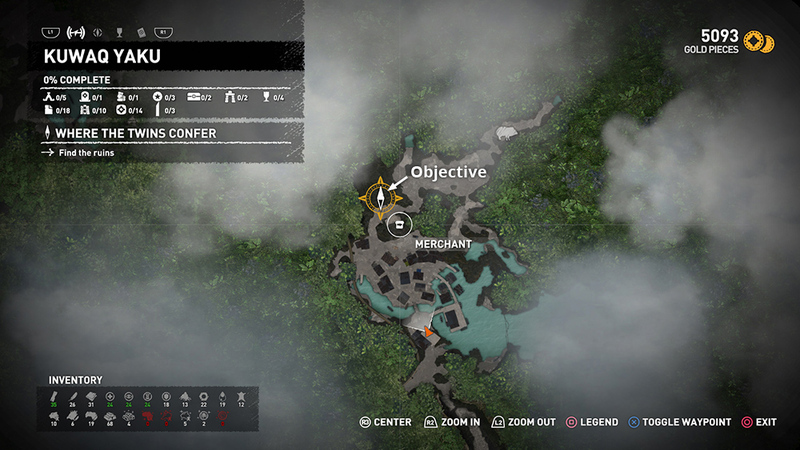 If you're going for 100% completion, return up the steps to the east, to a ledge overlooking the HUNTING GROUNDS. Just ahead there's a feathered totem (1/5) hanging from a tree. (screenshot) Shoot it down to initiate another Challenge: Nam Deus. 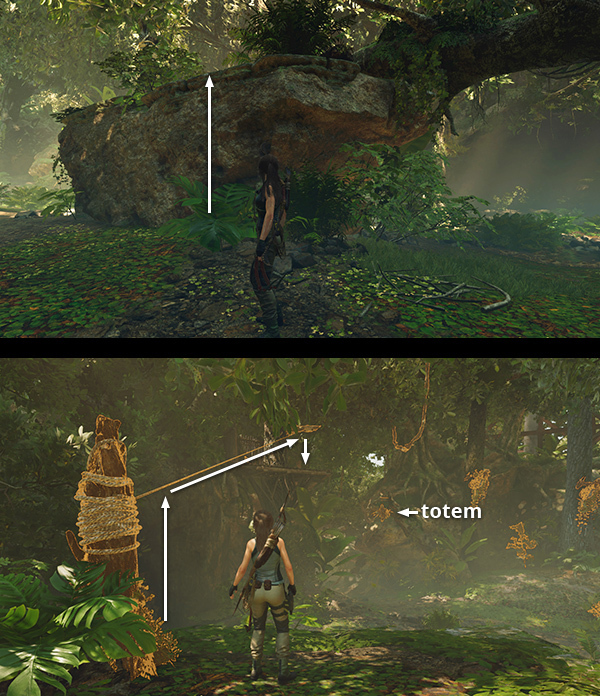 To complete it, you'll need to find and destroy four more of these totems. If you have unlocked the Owl's Wisdom skill, they will glow when you activate Survival Instinct, making them much easier to spot. If not, the locations are marked with yellow dots on the annotated level map and described below. Then drop down into the HUNTING GROUNDS. You can actually hunt capybara, peccary, birds, and rabbits here in order to collect hides, fat, feathers, and XP, but there are other rewards too. You can explore in any order you like, but we'll follow the north wall to the Challenge Tomb at the far end of the valley. Then, after exploring the tomb, we'll head back to the south, getting all the pickups we missed before. Then we'll return south to the village, completing the Crude Awakenings Challenge along the way. Just to the southeast of the metal barrier is another totem (2/5) you can shoot down for the Nam Deus Challenge. 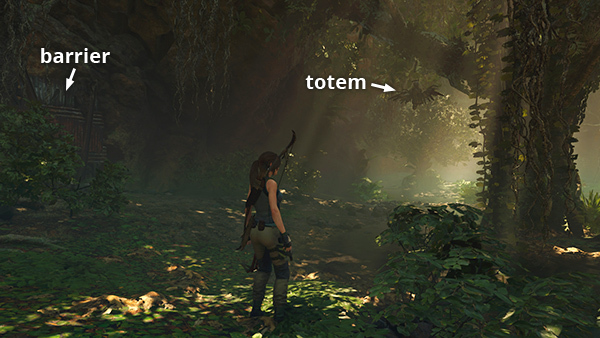 (screenshot) Go around to the northeast side of that same tree to find the next totem (3/5) hanging from a different branch. Shoot it down as well. 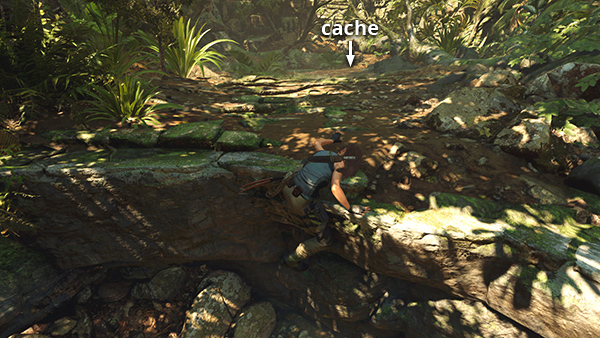 (screenshot) There are some interesting ledges on the south wall of the valley, but we'll explore there later. Continue toward the end of the HUNTING GROUNDS. 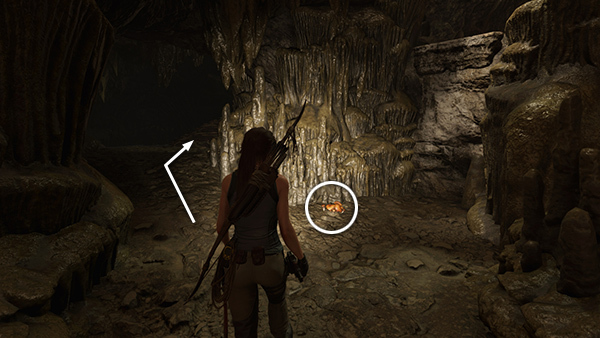 As you cross the little stream, the game tells you there's a Challenge Tomb nearby, and you'll notice the familiar yellow-painted decorations. 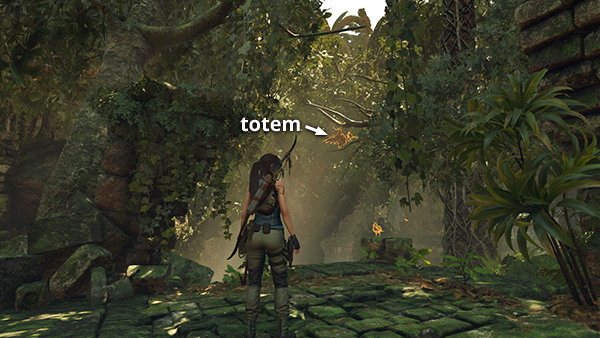 Look up to spot another totem (4/5). 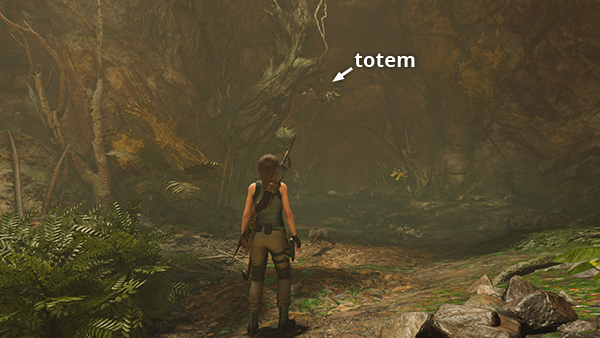 (screenshot) It's a bit difficult to spot in the dim light, especially without Survival Instinct, but there's a capybara carcass lying on the ground just below and to the right of the totem. Shoot it down and continue northeast toward the tomb entrance. As you move into the area with slightly better lighting, you'll spot the next totem (5/5) hanging above. 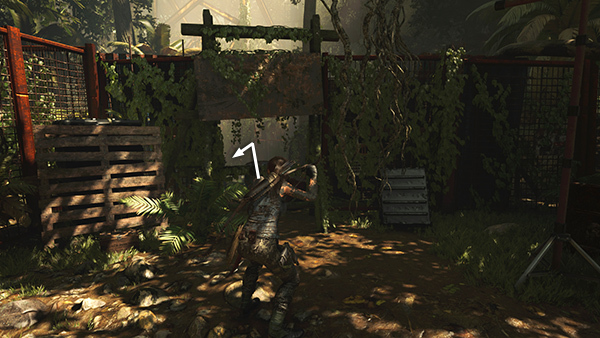 (screenshot) If you've found the previous ones, shooting this one down will complete the challenge. 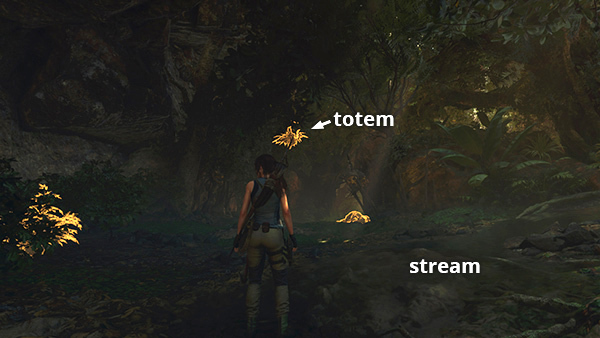 If not, don't worry, there are more totems. Follow this link for the HOWLING CAVES CHALLENGE TOMB WALKTHROUGH, which includes the Petroleum Deposit Base Camp, a mural (8/10), 2 documents (16/18 and 17/18), and a survival cache (11/14). Examining the tomb stele unlocks the Scavenger Skill Huracan's Mantle, which reduces damage from fire and explosions. 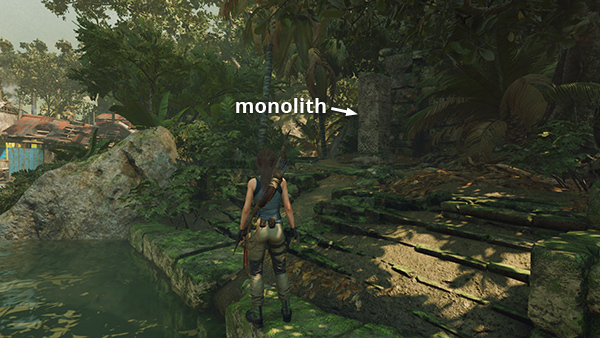 NOTE: This is the same area where you found the monolith riches buried "under the nose" of the submerged statue earlier. (See above.) So you may have already found some of the items here. RETURNING TO THE RUINS: Continue up the path to where the last barrel was. The road to the right (north) leads back to the HUNTING GROUNDS. Head to the left to return to the village. On the way, crack open the salvage crate sitting on the ground behind a pickup truck. You re-enter the village near the MARKET. It'll be a little while before you return here, so visit the shopkeeper inside to sell extra resources and buy whatever you need. Then continue out the back of the MARKET to the RUINS you visited earlier. 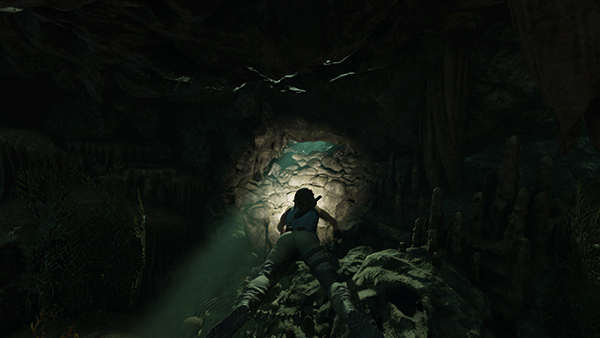 Inside, Lara calls out for Jonah. He answers from below. But before going through the opening on the left, head up the stairs to find the last mural (10/10), Temple of Death (Mam Dialect/Exodus Story), if you didn't see it the first time you visited this area. (screenshots) Return downstairs and go through the opening near the lantern to meet the others. Jonah and Abby show Lara the "Mouth of the Jaguar," a doorway painted to resemble a huge cat's open mouth. 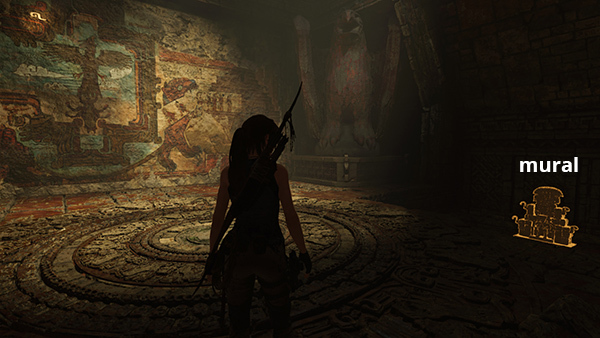 Lara tells them about the mural she saw in the Temple of Life, describing a series of trials, then steps inside. Before the others can follow, a cluster of spears spring from the wall, blocking the opening. 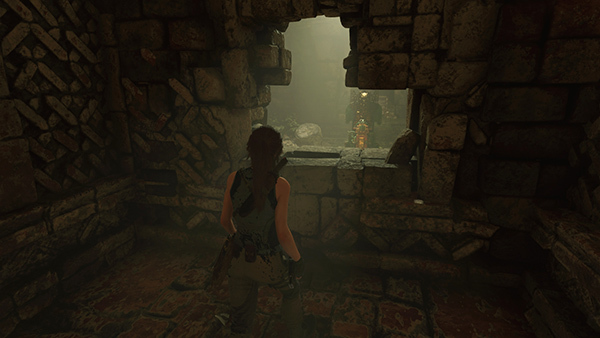 Abby says she may know another way around, so Lara suggests they meet up on the other side, and once again goes on alone. After the cutscene, you receive an XP award and a new goal. Move forward and down the stairs, then dive into the pool below. From there you can continue northeast through either a lower/left or upper/right passageway. Both lead to the same flooded cavern, so it doesn't matter which way you go. 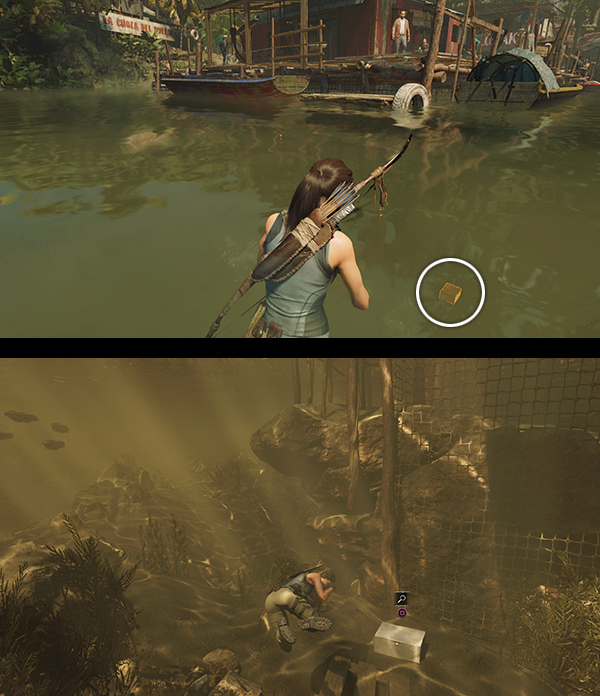 There are a few aquatic plants you can collect and resource containers to loot, but no major collectibles. As you enter this area, watch out for moray eels. If you have Survival Instinct enabled, the eels glow red (screenshot), and you can avoid them and occasionally hide in the sea grass on the cavern floor like you did with the piranhas. 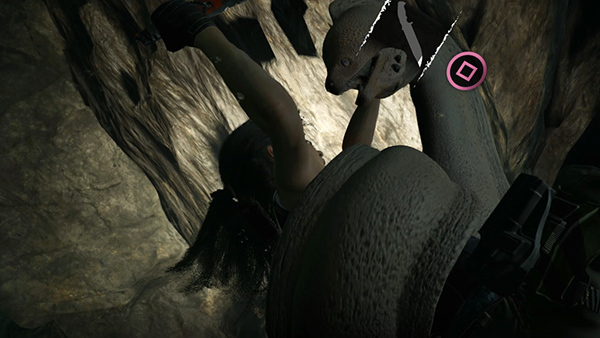 If Lara does encounter an eel, it's not an instant kill. 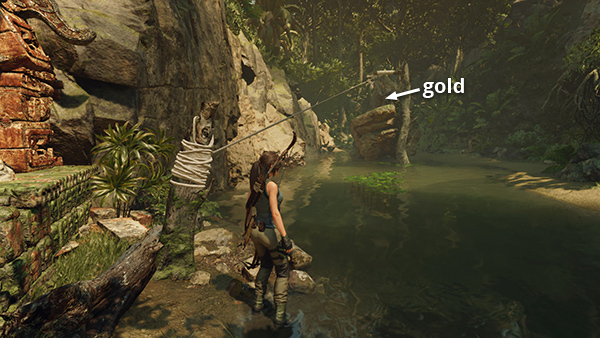 Rather, the eel will twine itself around Lara, triggering a Quick Time Event in which you'll need to mash Interact to fend off the eel. 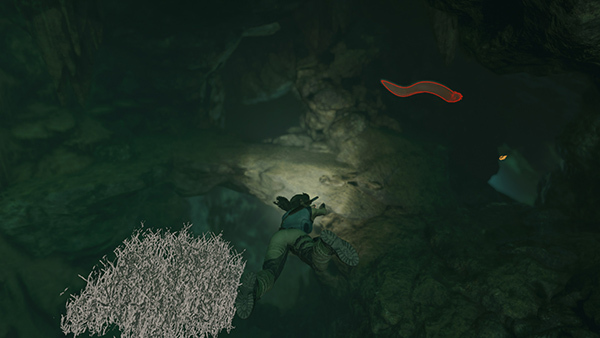 (screenshot) It's easy to run out of air and drown if you spend too long struggling, so avoid the eels if you can. 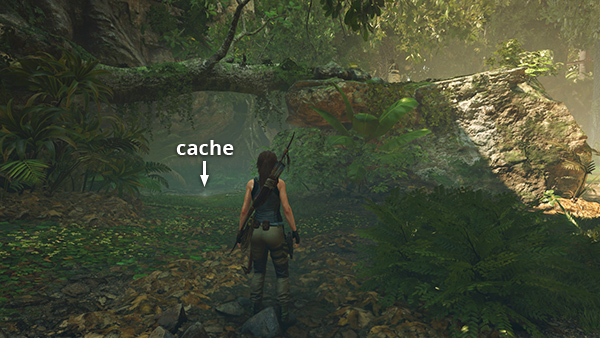 Once you reach the second air pocket, you can turn around and go back for any collectibles you missed, returning to breathe between pick-ups. When you're ready to move on, continue northeast, through the narrow vertical opening (screenshot) to a pool where you can surface. Enter the tunnel ahead and pick some mushrooms. Tunnels lead off to the left and right. The left one has treasure, so go that way. 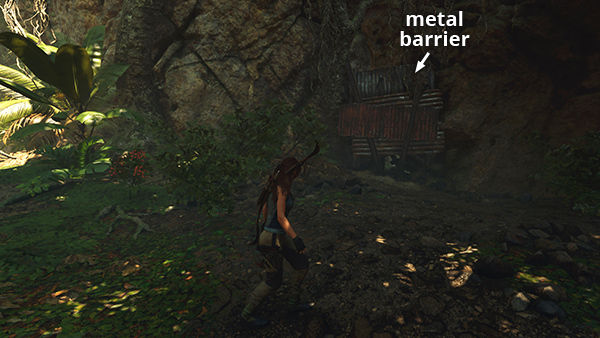 (screenshot) Move up the wooden ramp and jump to grab a handhold on the wall ahead. Climb into the room above. (screenshot) Pick up lumps of jade ore on both sides of the table. 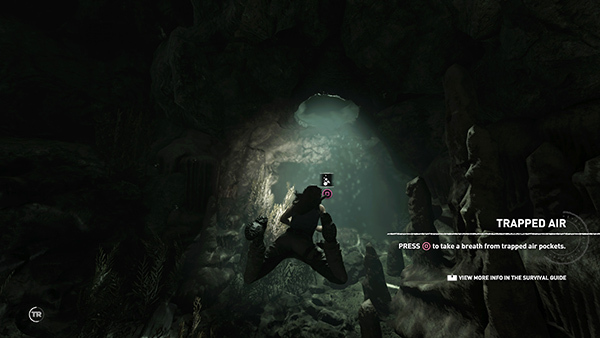 (screenshot) Then continue through the tunnel to the northwest. There are more mushrooms about halfway along and a resource container just outside the tunnel on the left. Move to the end of the wooden walkway overlooking the pool and spider mosaic. Jump out and grapple the craggy stalactite protruding from the ceiling. 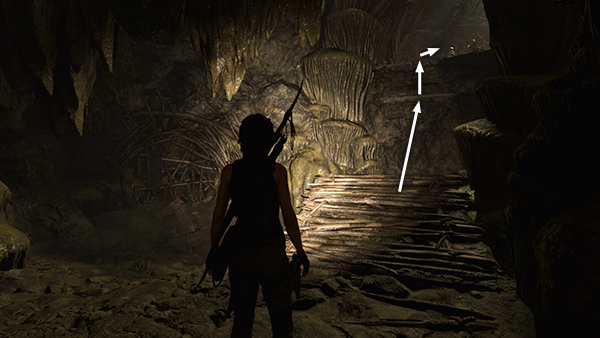 (screenshot) Rappel down until Lara is level or a little below the ledge above the mosaic. Then swing back and forth to build momentum and jump on the forward swing to grab the ledge. Pull up and continue through the tunnel to the next level. 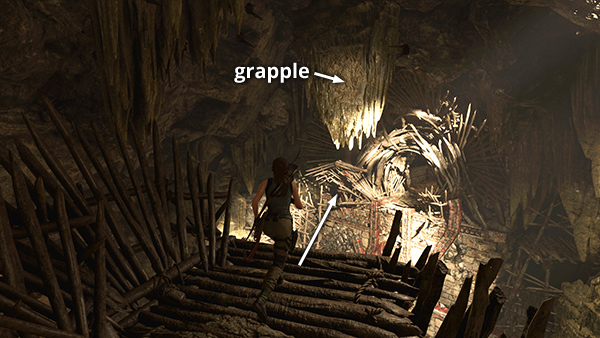 NOTE: If you're having trouble with this grapple sequence, you can download my PC save file. Instructions are included. REVISITING THIS LEVEL LATER IN THE GAME: Even if you've covered all bases during your first visit, there will still be a few areas and items you can't reach. You may want to wait until you have all of the necessary proficiency and gear and then make one trip back to clear the level. You'll need the LOCK PICK, ROPE ASCENDER, SHOTGUN, and Fluent Quechua. 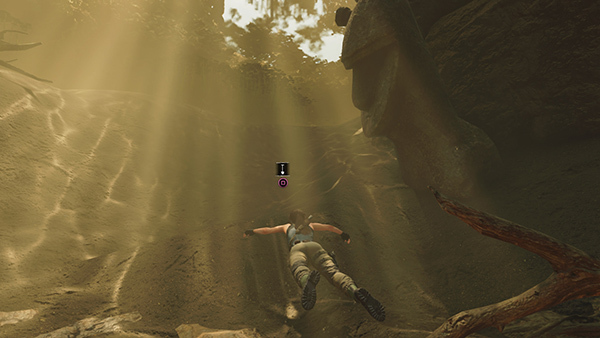 If you are missing some items that were covered above, note that two new base camps appear once you've beaten this level: the Temple of Life, in the area where you solved the Maya numeral puzzle the swam through the piranha-infested cavern, and the Airfield Dirt Road, just south of the crashed plane where you fought the Trinity guys. So you can fast travel into any area with major collectibles. 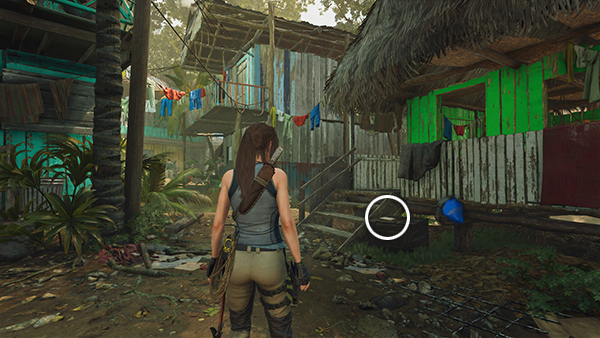 I will add a Quick Collectibles Guide once the main walkthrough is finished. If you have also acquired the ROPE ASCENDER, you may want to do this immediately after the monolith and final document. 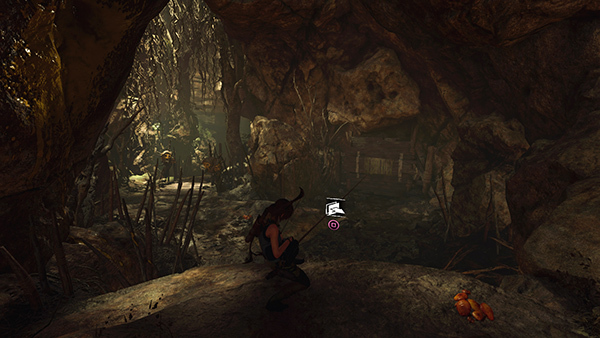 Return to the entrance to the HOWLING CAVES CHALLENGE TOMB, at the northeast end of the HUNTING GROUNDS. There's a wooden barrier that can only be pulled down using the ascender. 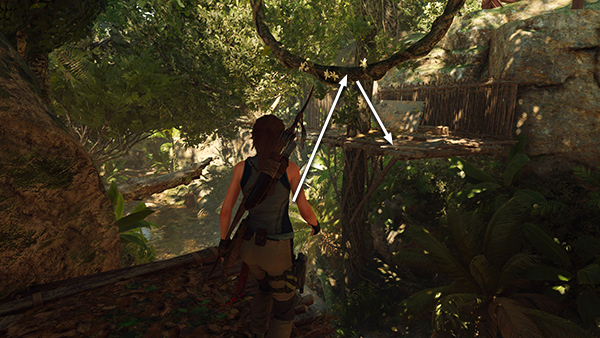 Shoot a rope arrow at the barrier, and Lara will automatically pull out the rope ascender. 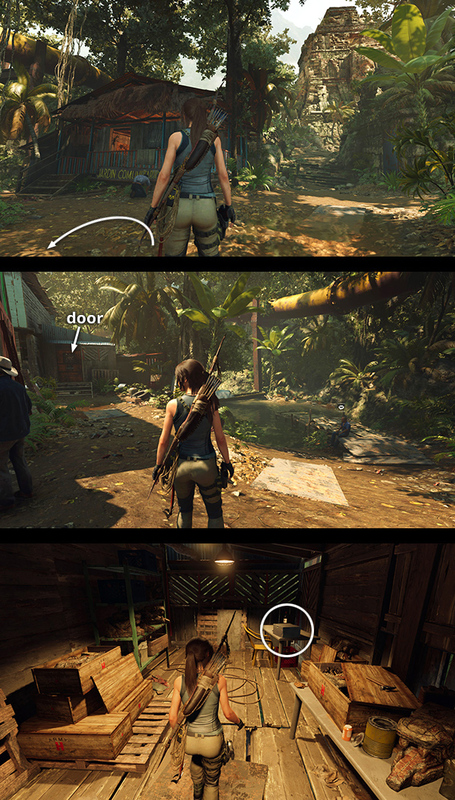 Hold Interact to yank the door out of its frame. (screenshot) Inside is a vein of gold ore. The SECOND CRYPT also requires the SHOTGUN. It is located at the south end of the stream near the Hunting Grounds Base Camp. (screenshot) There's not much to it. 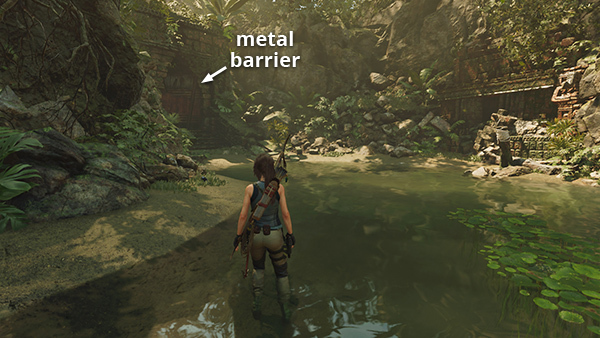 Just use the gun to destroy the metal barrier. (screenshot) Go inside and open the sarcophagus to find an outfit component, Vestige: Condor Cowl of Urqu, which increases the duration of focus herb effects, plus 750 gold pieces. To reach the second treasure chest, fast travel to the Temple of Life Base Camp, one of the two camps that appear on the Kuwaq Yaku map later in the game. 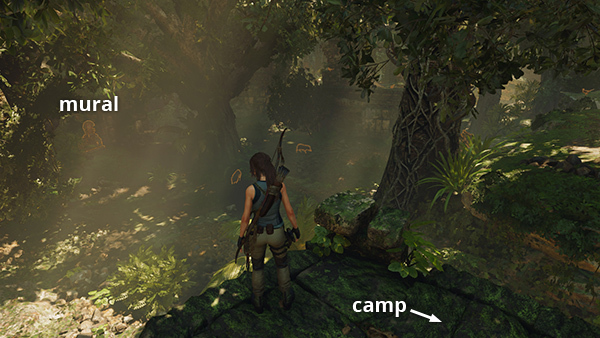 The camp itself is in the northernmost part of the level, on the stone circle where Lara read the mural about the jaguar mouth, silver eye, etc. Go through the opening to the north of the campsite, past the stele, and through the doorway on the right. Dive into the pool and swim down through the opening on the southeast side, just like you did the first time. 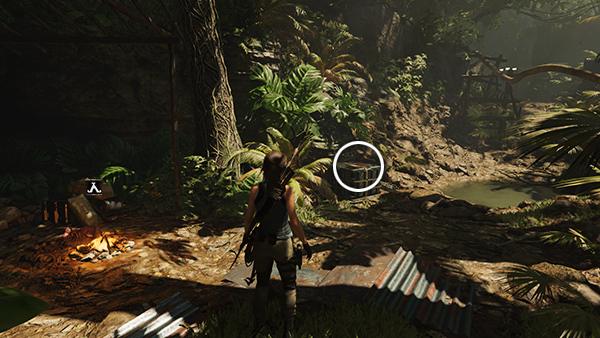 The treasure chest (2/2) is in the ruined building on the southwest side of the flooded cavern. 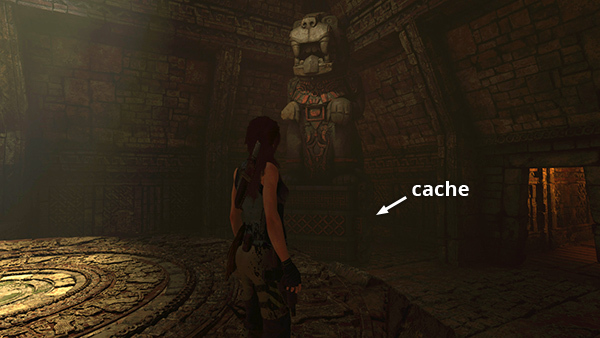 The chest contains an Artifact, an Inti Statuette, (Quechua/The Resistance). 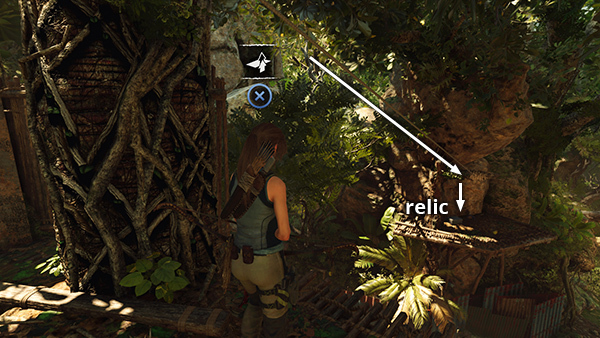 This does not count as one of the 4 official relics, but you can examine it later in the Artifacts menu. You also receive a few random rare resources. There is a map of the route and other details on this page with screenshots. It also describes how to reach the exit once you've opened the chest. When you surface in the pool south of the cavern, you'll retrace the same route you took when you first passed through this area, minus all the enemies. If it's been a while, refer to the main walkthrough, above, for details. 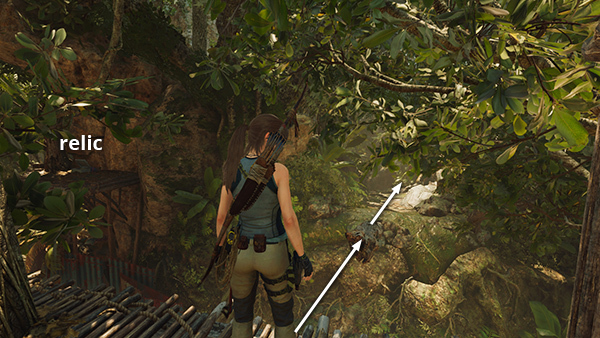 After following the path south through the jungle, you'll go through the clearing with the crashed airplane, then climb the wooden wall in the southeast corner of that area to reach the Airfield Dirt Road Base Camp. You can then continue on foot or fast travel out to wherever you left off. THE FORGE DLC: One of the game add-ons is set here in Kuwaq Yaku. 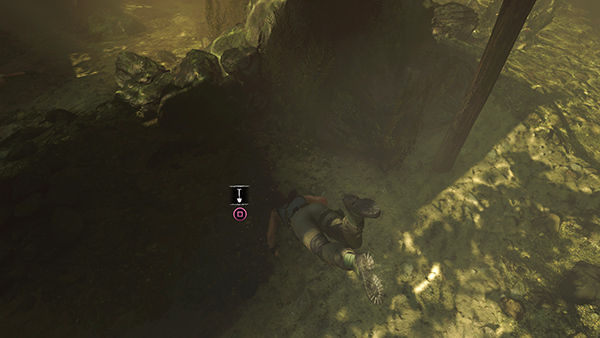 It includes a Side Mission and a Challenge Tomb. 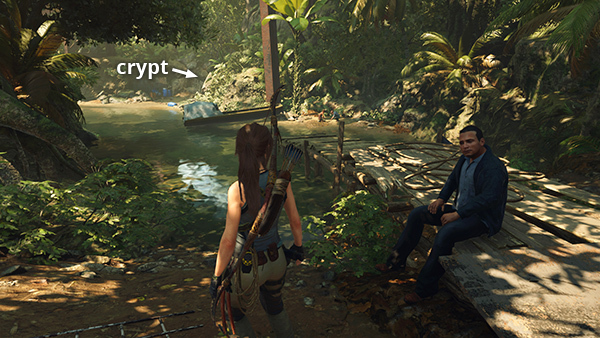 You don't need special gear to complete it, but it is only available after you reach the HIDDEN CITY level and are able to fast travel back to Kuwaq Yaku. Since this is optional content, it's covered in a separate section. †UPDATE HISTORY: 9/29/18 - First draft of walkthrough posted online. 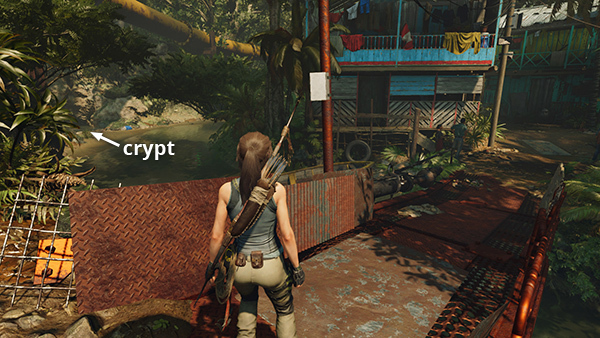 10/1/18 - Added bug note about 100% completion on Xbox One, and note about saving 6,100 gold pieces to buy the lock pick and rope ascender in the Hidden City. 10/10/18 - Added notes about 100% completion and monolith bugs being fixed in the most recent patch. 10/22/18 - Added info on the Serpent's Fury skill and Chain Gang achievement/trophy. 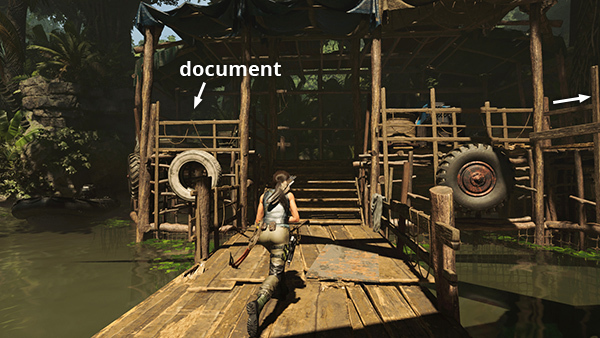 Also added the correct name for document 9, thanks to Henry. 11/16/18 - Added another totem for the Nam Deus Challenge. 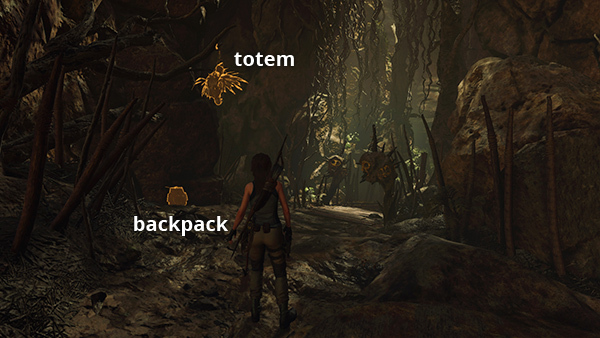 You still only need to destroy 5 totems to complete the challenge, but I had missed one of the 7 my first time through the area. 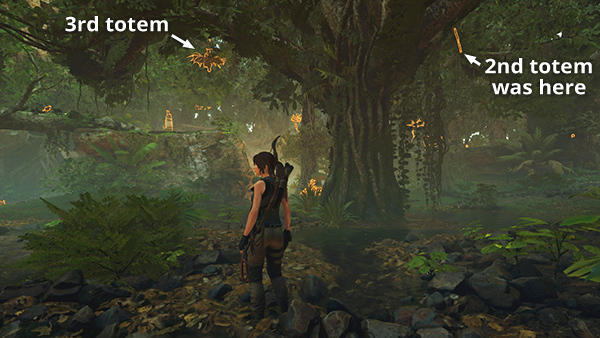 Also added a note about the achievement/trophy related to the side mission. 11/24/18 - Added links to The Forge DLC walkthrough. 12/8/18 - Added gold awarded for completing the mission. 1/6/19 - Updated the section on The Forge DLC. 1/19/19 - Made a few minor tweaks and added Spider Trial save file since people seem to have trouble here.